The Jackie Robinson Parkway is a 4.95-mile (7.97 km) parkway in the New York City boroughs of Brooklyn and Queens. The western terminus of the parkway is at Jamaica Avenue in the Brooklyn neighborhood of East New York. It runs through Highland Park, along the north side of Ridgewood Reservoir, and through Forest Park. The eastern terminus is at the Kew Gardens Interchange in Kew Gardens, Queens, where the Jackie Robinson Parkway meets the Grand Central Parkway and Interstate 678 (I-678, the Van Wyck Expressway). It is designated New York State Route 908B (NY 908B), an unsigned reference route. The parkway was officially named the Interboro Parkway until 1997, when it was renamed for former Major League Baseball player Jackie Robinson. The Jackie Robinson Parkway starts where Jamaica and Pennsylvania Avenues intersect in the Brooklyn neighborhood of East New York. Exit 1, Bushwick Avenue via Highland Boulevard, is a westbound-only exit. The highway enters Queens and passes Mount Judah Cemetery before exit 2 at Vermont Place and Cypress Avenue, which lead to Highland Park and the Hungarian Cemetery. Exit 3, Cypress Hills Street, leads to Cypress Hills Cemetery, where Jackie Robinson is buried. Here the parkway narrows and makes sharp turns. At exit 4, Forest Park Drive, the parkway enters Forest Park. Exit 5 is at Myrtle Avenue and Woodhaven Boulevard. At exit 6, Metropolitan Avenue, Union Turnpike straddles the parkway, but there is no access to or from Union Turnpike. 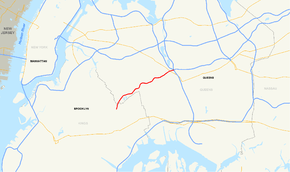 The parkway and Union Turnpike then exit the Forest Park neighborhood, and go under Queens Boulevard (NY 25). Union Turnpike shares a diamond interchange with Queens Boulevard, but there is no access from the parkway. Exit 7, an eastbound-only exit, goes to the Van Wyck Expressway (I-678) northbound (no access southbound). Exit 8 (eastbound only) is the Grand Central Parkway, where the Jackie Robinson Parkway ends. Officials proposed an amendment to the Rural Cemetery Act to "provide for the construction of a road" running through the Cypress Hills Cemetery, connecting Brooklyn and Queens. This proposed road was to serve as an extension of Eastern Parkway, running though Cypress Hills Cemetery toward Forest Park where it would connect to an existing road. This bill was introduced in the New York State Legislature in 1901 but failed to pass, and failed to pass every subsequent year it was reintroduced in the legislature. The bill finally was passed in 1908, however no funds were allocated to the project. In order to exploit a "condition of approval" with the Cypress Hills Cemetery expiring on 1 January 1928, New York City authorities began expediting plans for the parkway in March 1927. The trustees of the cemetery approved the city's acquisition of land for the parkway on the condition that "physical improvement of the road be started" prior to 1 January 1928. The Board of Estimate convened on 24 March 1927 to discuss the cost estimates for the parkway, including land acquisition and grave removal. Several civic associations from Glendale and Ridgewood suggested the cost of parkway construction be split - 45% of the cost would be covered by New York City, 35% would be covered by Brooklyn, 15% by Queens and finally 5% by residents living south of the parkway. This proposal would have exempted Ridgewood and Glendale, neighborhoods north of the parkway, from paying for the parkway construction. The planned parkway would serve as an extension of Eastern Parkway from its terminus in Brooklyn, running through Highland Park toward the Ridgewood Reservoir. From the Ridgewood Reservoir, the parkway would cross Cypress Hills Street into Cypress Hills Cemetery. The parkway would "pass through the cemetery just south of the boundary" with Mount Carmel Cemetery and enter Forest Park, where the New York City Parks Department would construct a "driveway several hundred feet long from the end of the parkway" to connect with an existing road in Forest Park. The estimated costs for this planned parkway was projected at $3,500,000. On 2 January 1931, city officials announced that the Interboro Parkway would parallel Cypress Avenue to the north, running "along the north side" of the Ridgewood Reservoir to Cypress Hills Street. Cypress Avenue would, as a result, be paved from Cooper Avenue to the Interboro Parkway. Grave exhumation and reburial was required before construction of this section of the highway could begin, and costs were estimated at $675,000. In the meantime, an extension of the parkway was being constructed from Forest Park toward Metropolitan Avenue and terminating at the Grand Central Parkway, at the present-day Kew Gardens Interchange. The Interboro Parkway was scheduled to open for traffic on 1 November 1934. However, in late December 1933, plans for the parkway were revised; the western terminus of the parkway would be moved to its present-day location at the intersection of Highland Boulevard and Bushwick Avenue. Under this plan, an additional mile of road was to be constructed, requiring the condemnation of 7.5 acres of land from the Cemetery of the Evergreens. This tract of land did not require grave removals as was the case with Cypress Hills and Mount Carmel cemeteries. The Interboro Parkway opened to traffic in June 1935, remaining unfinished until the completion of the Highland Boulevard-Bushwick Avenue extension in September 1935. 1 2 "2007 Traffic Data Report for New York State" (PDF). New York State Department of Transportation. July 25, 2008. Retrieved July 17, 2009. ↑ Roleke, John. "Jackie Robinson Pkwy (Interboro Pkwy)". About. The New York Times Company. Retrieved August 29, 2007. 1 2 3 4 5 "Back When The Jackie Robinson Parkway Was Just A Dirt Road". Times Newsweekly. 28 December 2001. Retrieved 29 July 2016. 1 2 3 4 5 6 "Concluding The Story Of The Creation Of The Jackie Robinson Parkway". Times Newsweekly. 4 January 2002. Retrieved 29 July 2016. 1 2 3 "Jackie Robinson Parkway - Historic Overview". Retrieved 29 July 2016. ↑ Roberts, Sam (7 October 1985). "The Legacy of Westway: Lessons from Its Demise". The New York Times. p. A1. Retrieved 29 July 2016. ↑ "New York City Department of Parks and Recreation: Jackie Robinson Parkway". Retrieved June 4, 2009. ↑ Montefinise, Angela (February 24, 2008). "Tragic Toll of Qns. Roadway". New York Post. ↑ Google (January 5, 2016). "Jackie Robinson Parkway" (Map). Google Maps. Google. Retrieved January 5, 2016. * Asterisks indicate at-grade or partially at-grade parkways.